The Rayburn House Office Building, completed in early 1965, is the third of three office buildings constructed for the United States House of Representatives. It occupies a site southwest of the Capitol bounded by Independence Avenue, South Capitol Street, C Street S.W., and First Street S.W. Southwest of the U.S. Capitol, bounded by Independence Ave., South Capitol St., First St., and C St., S.W. The design of the building is a modified H plan with four stories above ground, two basements, and three levels of underground garage space. A white marble facade above a pink granite base covers a concrete and steel frame. One hundred sixty-nine Representatives were accommodated in three-room suites, with modern-for-the-time features such as toilets, kitchens, and built-in file cabinets; nine committees were also moved to this building. Amenities include a cafeteria, first aid room, Library of Congress book station, telephone and telegraph room, recording studio, gymnasium, and facilities for press and television. A subway tunnel with two cars connects the building to the Capitol, and pedestrian tunnels join it to the Longworth House Office Building. On either side of the main entrance to the building stand two ten-foot marble statues by C. Paul Jennewein, Spirit of Justice and Majesty of Law. On the east and west walls are eight marble rhytons, drinking horns formed of mythical figures known as chimeras. Speaker Sam Rayburn, for whom the building was named in 1962, is represented in the building in an oil portrait by Tom Lea, a marble relief by Paul Manship and a six-foot bronze statue by Felix de Weldon. The Architect of the Capitol (AOC) House Superintendent's Office is responsible for the day-to-day structural, mechanical and domestic care of the House Office Buildings. Earlier efforts to provide space for the House of Representatives had included the construction of the Cannon House Office Building and the Longworth Building. In March 1955, Speaker Sam Rayburn introduced an amendment for a third House office building, although no site had been identified, no architectural study had been done and no plans prepared. Architect of the Capitol J. George Stewart, with the approval of the House Office Building Commission, selected the firm of Harbeson, Hough, Livingston and Larson of Philadelphia to design a simplified, classical building in architectural harmony with other Capitol Hill structures. 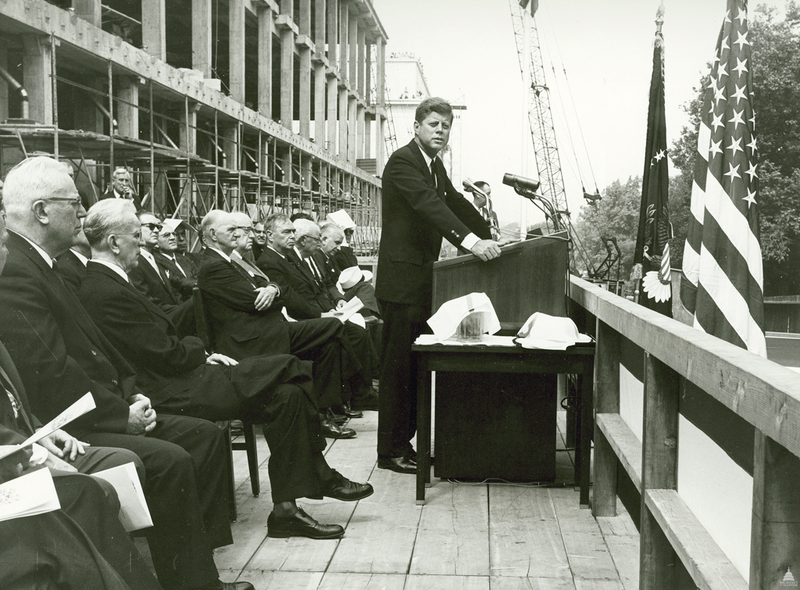 President John F. Kennedy speaks at the cornerstone ceremony on May 24, 1962. 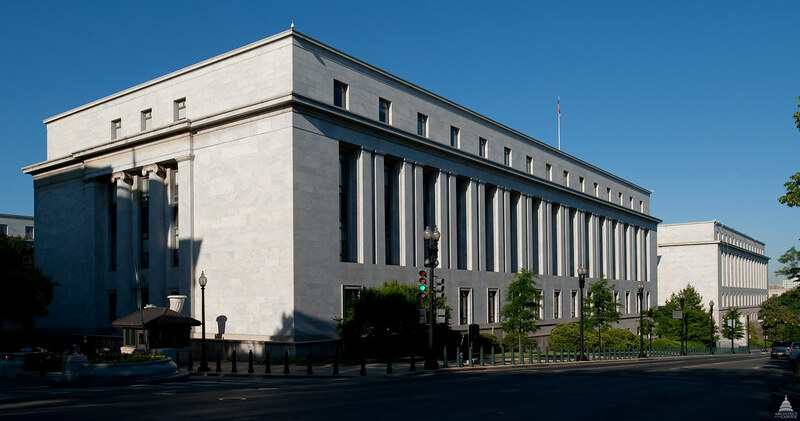 The area west of the Longworth Building on Squares 635 and 636 was chosen, with the main entrance on Independence Avenue and garage and pedestrian entrances on South Capitol Street, C Street and First Street S.W. The cornerstone was laid in May 1962, and full occupancy of the building began in February 1965.